Her mind was clouded, but sure of purpose as she ascended the spiraling staircase upward. Flickering torches mounted on the walls sent a splintering array of shadows outward from her body as she passed by them. Each time her eyes met light they burned, and she squinted as her hooves clopped on the stone stairs. Bits and pieces of the world were creeping in and out of focus. She could feel her mind straining at the edges of reality, the tiniest fragments of her vision disappearing and reappearing without provocation. One minute she would affix her gaze to a tapestry on the wall, glimmering brightly with finely woven patterns, and the next moment would be clenching her teeth, trying desperately to rid her vision of the thousands of glowing spiders sliding through the cracks in the fabric. Nothing was certain any longer, and that was why she must do this now, tonight, and not wait a second longer. Luna breathed in the crisp refreshing breeze as she gazed over the castle parapets, scanning the far-stretching horizon as far as it would go. There was so much beyond the light left in the sky – so many ponies peacefully asleep waiting for their day to begin; towns, cities, and untamed wilds beyond, an entire world of unseen life that had yet to awaken, blissfully unaware of the beautiful moonset they were about to miss. I suppose they missed their chance. The nervous voice of a timid pony in a white coat bounced off the well-laid stone of the castle infirmary as he fretted at his patient’s bedside. Accompanying his physician’s attire was a brown bowler hat, a fitting compliment for his bushy moustache. Next to his feet lay a doctor’s bag of medicinal equipment, and he tapped it errantly with his hind hoof as he stood nervously next to a dark pony covered in soft bedding. “I am truly sorry, doctor, I never meant to cause alarm. I simply don’t understand how I could have been so careless.” Luna’s voice was prim and proper, enunciating each word slowly for maximum articulation. Her speaking mannerisms felt antiquated, aged like a family heirloom from her time of absence. The doctor chuckled loudly, overwhelming the timid forced giggle that came from Luna’s mouth. Her expression was polite and cheerful, but strained, as though she were gritting her teeth too hard to be grinning normally. Every so often, one of her eyes would twitch ever so slightly, unnoticed by the others in the room. That was, the doctor, and Luna’s sister, Princess Celestia. The white alicorn’s brow had been furrowed since her arrival, and the apparent stress on her mind showed no sign of leaving. The sun goddess was pacing anxiously in a very short distance as her sister received her final bout of examinations. “Well, you seem to be on the path to a speedy recovery, so I’ll simply leave you for some rest, mhm-hmm?” The doctor dipped his head downward to his saddlebag and tossed it onto his back with a flick of his muzzle. Luna simply nodded, still wearing a concentrated smile. Content with another job well done, the brown earth-pony gave a cordial bow to Celestia before dashing out the door, the clop of his hooves and cheerful humming the only sound for several minutes. The sisters waited quietly, neither of them speaking a word until the air had grown fully thick with uncomfortable silence. 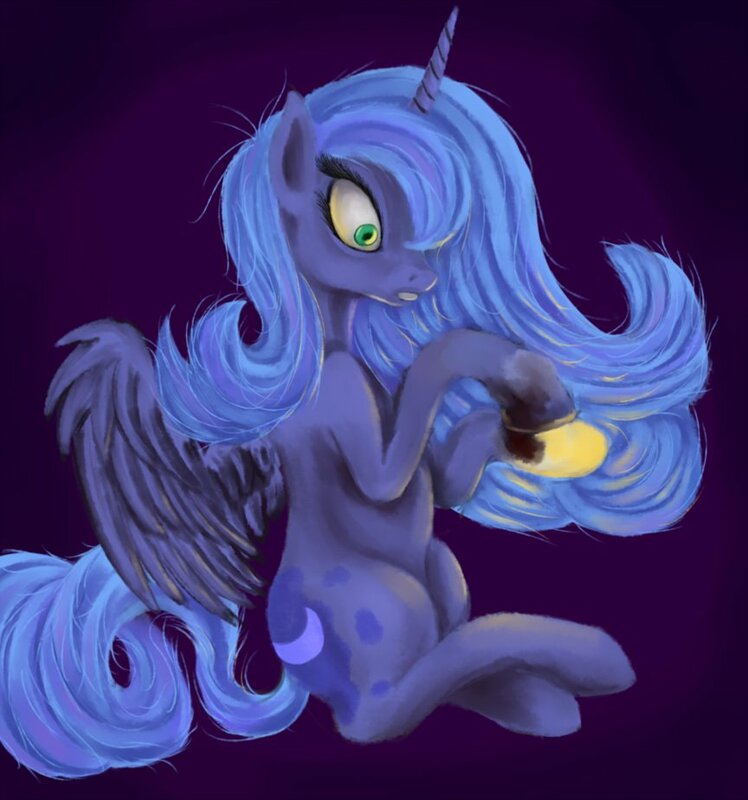 “Luna...” Celestia began, hesitating. Her sentence was interrupted by her sister’s pre-emptive response. That nickname, that Luna had used since the two of them were the youngest of fillies having not been uttered for a thousand years till now; it made Celestia’s heart tremble every time. Part of her felt that Luna knew this... that her sister used it only to tug at her emotions - but to what end? No, it was foolish to be suspicious of such a thing, a sweet pet-name shared amongst siblings. Celestia blinked, collecting her thoughts, and cleared her throat before resuming to her speech. “Luna, my sister, are you certain that you are alright?” the white alicorn’s speaking manner was as formal as her public addresses indicated. Her sister’s reply was just as aged, though not possessed of the cultural refinement developed from a millennium of public diplomatic discourse. Luna’s eye twitched ever so slightly as she stared forward at her sister, mouth locked into a steadfast smile. Celestia wasn’t sure she had seen it, so she cleared her throat again softly and responded. Eye twitch. Luna shook her head softly, still grinning. “Not at all, my dearest sister. Whatever would give you that idea?” Twitch. Celestia had noticed that one. Her brow furrowed in concern. While a subtle tic meant little in the pursuit of deductive reasoning, her sister’s mannerisms felt slightly… off. Celestia’s eyes stared intently forward, fixating on Luna’s gaze, but detected no flashes of movement, nothing to indicate her sister was not being one hundred percent sincere. After an impromptu staring contest that seemed to go on longer than was comfortable, Celestia shifted her face sideways, now focused on the painted stone wall. She sighed before turning her head back, smiling softly. Her sister only grinned back at her and nodded, face still frozen in an overly enthusiastic contortion. To call it a smile now might be inaccurate. Celestia walked slowly towards the door, pausing before she exited the infirmary. She glanced backwards at her sister, who was sitting on her haunches underneath the pristine white bedding, the quilt pulled almost to her neck. Luna gave a small wave as her sister looked back, and Celestia sighed quietly before turning and making her down the castle hall. As she exited the room, Luna’s eye gave another twitch. The bed-ridden alicorn waited several moments, making sure the patter of hoof steps on the stone floor had ceased before looking downward at herself. Her black fur, normally soft and well-groomed, was now soaked with sweat. She blinked, and looked closer. A beam of sunlight took that moment to shine its way inside the room through the nearby window, casting a gentle glow over the infirmary bed. Luna struggled to hold back a scream. The instant the light touched her, she could feel it again. Burning. Crawling. A sensation like a thousand poisonous ants squirming through her veins pulsed underneath her skin. Her fur stood immediately on end, her pupils dilating rapidly as the stinging feeling spread, emanating from the point of contact with the sunlight and blossoming out to the rest of her body. The way she felt was horrifying beyond belief, even in its familiarity. She had been able to distract herself while the others were around, closing her eyes and thinking of the moon, or the quiet blanket of darkness that encircled her at night, making her feel safe; but now that they were gone, the only thing left to draw her attention was the feeling that had been welling up inside her since she had awoken, catalyzed with the horrific burning ray of putrid brightness that lit her skin ablaze. It hurts, she thought to herself. It burns. I want it to stop. Simple, rapid impulses flashed into her mind, the mantras she had repeated to herself since this had started. Every morning the daylight stung a little more, and she found herself at times wishing she could claw her own skin off, rending herself to the bone to escape the feeling of scuttling agony that welled up inside her each day. She had been clumsy, the night previous, hoping to make things better in such a way, with so little planning. As she struggled to gain focus of her thoughts, her eyes drifted from the prickling of her own fur to the bed-sheet she had wrapped around her forelegs. A soft, comforting pearlescent white matched the rest of the room’s décor, the odd hanging picture or wall-tapestry presenting an aura of serene beauty. While the rest of the room’s decorations were a flat and clinical tone, the blanket was a soft, egg-shell white. A series of pink lines were stitched into the bedding, spiraling outwards into a multitude of intricate patterns woven all throughout the fabric. The stitches were thin, and they glowed in the light, sparkling against the white background. Egg-shell white. Egg-shell. She could see them now. Burrowing at the cracked egg she had wrapped herself in, struggling to break free of their soft-shelled prison. Sun spiders, thousands of them bulging inside. The sun must have heated the egg just enough to bring them to their final stages of gestation, and now it was time to be born. Time to escape through the gleaming red splinters that splayed in every direction, and make their way into the world. Luna’s face shuddered as she saw the first batch emerging from the blanket’s corner, a red cross-stitch spewing forth a wave of tiny, glowing arachnids. The rest came shortly thereafter; thousands of sparkling spiders gushing from every one of the red seams and surging onto the white fabric, illuminated by the daylight from the nearby window. Luna’s mind reeled as she suppressed the thousand decibel scream her lungs wished desperately to unleash. The spiders were the part she hated the most, and now, about to be covered in them, her body had frozen. As soon as the first tiny leg touched her fur, a reaction came without thought. She hurled the bug-covered blanket across the room, kicking it with her hind legs and shoving it as far away as possible. She gritted her teeth fiercely, her mind screaming at her to run as far away as she could, to get away from the clump of scuttling arachnids that would surely find their way out of the egg-blanket and make their way towards her. Looking down and noticing her hoof held a small cluster of the glowing black creatures, she let out a small shriek and kicked herself off the bed, shoving her body backwards into the infirmary wall. She pounded her hoof on the ground, shaking off some of the bristling spiders with each impact, smashing them into a luminescent paste when she was sure they had been removed. Every thump of impact shook the shelving on the walls, and Luna could feel her hoof bruising as she slammed it into the floor over and over again. Her wide-eyed stare was unwavering as she locked her vision on the soft blanket lying at the foot of the bed. The woven pink patterns were still and peaceful against the soothing shade of white. She looked down at her hoof. The remains of the bugs were gone as well, but they had left something behind – a bright orange glow, marking her foot and well-shorn fetlocks with an iridescent stain. It shone so brightly as she looked that she was forced to turn her eyes away, lest she be blinded. No, that couldn’t be. If she left it… everyone would know. Everyone would see. Had to fix it, had to be dealt with, now. What dampened the sunlight? Biting down on her lip, jaw still clenched in distress since she had tumbled from the bed, Luna inhaled deeply before bringing her hoof down hard on the unyielding stone floor. Her movement was sudden, as though she was sure undue time to think would lead to hesitation. The noise of the impact made her twinge almost as much as the pain; she had felt her quarter ache as it smashed against the ground, and opened her eyes timidly to assess the damage. No breakage. Time to try again. The second blow to the floor hurt almost as much, mostly due to the sickening crunch her hoof made as it collided with the stone. She had felt it that time, one of her walls cracking. Again, she looked downwards to determine whether a further blow would be necessary. It was dark, sticky, seeping from her wound, and she immediately raised the hoof closer for investigation. Yes, black. That was the enemy of the sun, the light, the brightness that burned her on its every touch, worming its way from her scalded body inside her mind. The blackness was inside her to make it better, but it had to be drawn out for use. Breathing deeply, Luna lifted the end of her smashed limb to meet with the tip of her other foreleg, and pressed the source of emanating blood down. It stung, but forced some of the pitch-black liquid outward onto her waiting sole, collecting a small amount of it before turning her hoof and applying it to her fur. Almost immediately, the glowing subsided, washed over by the lightless blackened fluid. Luna hummed quietly to herself as she painted the rest of the stain in blood until finally the light had been masked entirely, washed away by the purity of night. She sat there for a moment, clutching her injury, the ambient light of the room illuminating her shaken frame. The red stain on the floor contrasted the white of the infirmary, and the pattern she had painted on her hoof shone as brightly crimson as the pink stitches on the blanket sitting several feet away. Her mind wandered in thought as her hoof dripped a slow trickle of blood onto the floor, gathering in a small red pool, each drop making the tiniest sound as it collected. Still pondering, Luna looked downwards, to see her face reflected in the puddle. Pure black, as it should be. It had been quiet, for all those years. The empty void of space was not a suitable companion for conversation, as Luna had quickly discovered. So long in silence… she had forgotten what her own voice sounded like, what the noise of hooves on ground was; all of the world had escaped her memory, only to be rebuilt from scratch. The noises of life in Equestria after that thousand years had been like the first sounds to a foal’s ear on the day of its birth. Time had passed before her thoughts had been her own, of course. The jealousy and rage which had fueled Luna’s transformation into Nightmare Moon had been powerful – powerful enough to last hundreds of years, keeping her furious with anger every second of her banishment, plotting for the day she would make her return and exact the vengeance she had wanted for so long. Even nightmares, however, could not last forever. After over half a millennium subsisting on nothing more than her own anger, Luna’s resolve had wavered; or rather, the part of her that had become the shadowy essence of Nightmare had at last shown signs of regret. She had begun to contemplate the nature of her exile, something Celestia had no doubt planned when she had declared the thousand year banishment. At the beginning, Luna – Nightmare – had been convinced that her fury would continue to boil for the duration of her absence and further. But… as time passed, the rage had become harder and harder to hold on to. ‘Why am I doing this?’ she had thought, a passing glimmer of doubt that was quickly swallowed by jealousy. It had persisted though, reemerging to the surface of her mind more and more frequently as the days and years passed by. Until one day… she had stopped. All the anger and hatred bottled inside her for those hundreds of years had at last been exhausted; she could take no more of day after day seething in frustration at the way her precious night had been reviled. The hate inside her had been strong when her transformation first began, but it was not bottomless. So then she had been left alone, with nothing but her guilt and sorrow to keep her sane. They had done a poor job at that. Being alone in an endless sea of silence and nothingness was one thing when her mind was overtaken by the hostile force of Nightmare Moon, but after shedding the cloak of nightmares and regaining some semblance of her sanity, things were very different; different enough to make that tiny bit of rationale and peace ebb away. She speculated briefly during one of her more coherent periods that perhaps the way her mind was deteriorating had something to do with the moon itself. What were the tenants of the function of the moon? Lunar cycles, twenty eight day rotation. The reflection of the sun. An iridescent surface incapable of projecting its own light. It reminded Luna of herself now; barren, empty, flawed, a hollow replica of her sister’s inner light and divine beauty. The thought had crossed her mind at points during her exile, spurring her into a furious rage that led the essence of Nightmare to reclaim her body for periods, but it had never lasted for long, and the resulting exodus of the dark force left her feeling more drained than ever. It was likely as well that the constant merging and separation had put an increased tax on her mental faculties. Whatever the cause, she was dealing with the results now. Where was she? Oh yes, the moon. The word was there already; Lunacy, the ancient word for insanity that she breathed deep in her very essence. That was what she was undergoing now. Part of her understood that; a very tiny fragment that was still able to analyze and extrapolate the pieces of reality she could still perceive. She had gone mad. From the isolation, the quiet, the hundreds of years spent in hatred and agony and regret and guilt, days spent trapped in nothingness, nights spent enduring the glaring reflection of light that shone down onto Equestria, burning her body with its heat. Luckily her magic had not been sealed during her banishment; it was merely insufficient to break the barrier her sister had imprisoned her with. It could still be used to mend the damage from the sunlight, though the pain persisted. Really, all things considered, it was no wonder Luna’s mind had undergone such a collapse. She chided herself for thinking that way; whatever had broken inside of her was only an instrument to making herself whole again. Each shattered piece of her spirit was a step towards rebuilding; she just wished the journey was more accommodating. After the morning’s incident with the sun-spiders, Luna had taken some time to collect herself. Every encounter with the frayed edges of reality required more work, increasing effort to keep up appearances. The remains of her curative injury needed to be cleaned, the bed remade, all while keeping silent in her perpetual suffering. It was easier, much easier to stay strong during the night. That was her home, the place she felt safest. During the day, however, when the sun shone brightly and every ray sent her body into spasms of pain that blossomed quickly into white hot agony, blistering her mind… it became much harder to stay quiet, to appear calm. Even now, tucked away in the perpetual darkness of her room, it was a struggle. Luna was hunched over her desk, a stack of parchment on the corner piled higher than her head. Various arcane scribbles reached to every inch of the paper, sentences in obscure ancient languages accompanied by sketches in black ink. Pictures of the moon and its rotational arc, copied passages from textbooks detailing the effect of lunar rays during prolonged exposure. Luna was trying her hardest to research and document her spiral into insanity, but it was proving to be quite a daunting task. She had hoped the page she had written the night previous would be her last. Found solution, lunar incantation left in your hooves. Apologies. But it hadn’t. Her attempt to bring an end to this perpetual suffering had failed, and now she was forced to endure yet another day trapped in the forever reeling agony of her own madness. It only got worse as time went on; surely, if another action was not taken soon, the opportunity for a solution would be gone. Her mind would be too fragmented to take the steps necessary for her relief, and she would remain trapped forever in the hellish reality of the day time. Luna blinked at the page below her, straightening the aged parchment with her hooves and struggling to bring her eyes to focus. It seemed harder today, likely a sign that the final stages of deterioration were setting in. Steeling herself with the urgency of her task, she forced herself to read the words written in front of her; an excerpt from an ancient library reference she had copied hastily several nights ago. Instead of the clinical typeface of the printed book, the words were scribbled in the hurried shorthoof of Luna’s fanciful cursive. Alicorn physiology most resilient; only several recorded cases of significant injury. Regenerative properties inherent, magic only source of permanent damage. Standard physical trauma ineffective. Must be magical. Well, that was simple enough. As her attempt the previous night had shown her, a tumble from a castle parapet was hardly enough to accomplish what she had in mind – even now, her body barely ached from the impact of the ground, as if she had never fallen in the first place. As her mind reeled in contemplation, discarding new ideas as quickly as they arose, she noticed the shimmer in the corner of her study. She did a double take, glancing back up at the small glow after dismissing it the first time. No. Not in her room. Daylight had been blocked off from every available entry point; the windows had been boarded, the door sealed shut. There was no source from which the brightness could have entered – even besides which; its natural place would have been the end of a ray of sunlight, not huddled in the corner like some nervous, scuttling creature. The ball of brightness crawled sluggishly towards her desk as she stared at it, eyes wide in disbelief. Though she had become accustomed to the ways reality had begun to fall apart around her, even this was cause for alarm. If the daylight could move, that meant nowhere was safe. She had thought, tucked away in the safety of her pitch black study, that she would be safe from the spiders, the most disgusting manifestation of the sun she had encountered. Tiny wriggling bodies that scuttled in and out of nooks and crannies like the rays of daybreak between the crevices of stone that made up the castle walls. They could be everywhere, and it was an ever present struggle to avoid them, but she had always thought the darkness of her room would keep them at bay. Apparently, that was not the case. Again, her body froze in fear as the writhing mass of luminescent arachnids began to slowly move towards her. Always, she felt this way, paralyzed with distress the moment she saw them. The only way to avoid the feeling was to shut her eyes and sing quiet moonlight hymns, hoping to run past the disgusting creatures before they had time to reach her. When confronted in an isolated setting like this, however, movement didn’t feel like an option. Unfortunately, Luna realized she had no need to wait for the arrival of the spiders; the glowing clump that landed softly on the back of her neck told her that. Immediately she threw herself onto the floor, spinning wildly in an attempt to dislodge the mass of a thousand scuttling bodies that crawled over her fur. She could feel the tiny legs, the burning hot glow of the disgusting bodies making their way all over her back. Each tiny creature that might have tickled in its movement had it been a conventional spider instead gave the feel of a hundred needles of white hot fire being plunged into her veins. The rolling had failed to dislodge them, so Luna leapt to her feet and began beating her wings furiously, trying to toss the creatures off with the force of the controlled gust. Unfortunately, the spiders were persistent, and in her frenzy to remove the initial cluster, Luna’s rolling brought her right into the middle of the clump which had been crawling towards her moments ago. If the arachnids were grateful for her generosity, they didn’t show it; they merely joined their brothers in burrowing their tiny mouths of fiery sunlight into Luna’s flesh. She couldn’t help but scream now, loudly. They were everywhere, every inch of her body burned. She could feel them inside her, the poisonous sunlight venom making its way into her circulatory system. So much pain, the burning was unending. Searing. Gut-turning sickness. Every part of her on fire. Millions of them, burrowing into her, chewing into her skin, poisoning her. So many. So much pain. All reason was lost as Luna threw herself around the room incoherently. Every thought had fled her mind other than the removal of the bugs. Objects crashed from their shelves, and a book-case tumbled to the ground as she twisted and spun, colliding with anything that might dislodge them. Her screaming had stopped; there were no words, no sounds that could describe this pain. Silence was the only thing that came, her voice trapped inside the burning prison of her own body. As Luna rolled on the cold stone floor again, scraping against the unyielding surface in an attempt to remove more of the arachnids from her coat, she heard a knock at the door. Two quiet, quick impacts in rapid succession: knock knock. The door creaked quietly as it opened, Celestia’s gleaming visage peeking into the room otherwise enveloped in darkness. Her face was concerned as she scanned the chaos, seeing the toppled shelf and shattered pieces of glass-work that littered the ground, before noticing her sister sitting peacefully in the center of the study amidst the debris. “Luna…” she began, her speech slow and measured. Something felt very wrong. Luna’s smile was an attempt at mimicking her earlier forced grin, but this time at her own admission, she had no way to appear convincing. Every muscle in her body was screaming at her in agony, her mind felt on fire, her stomach was rolling with sickness; and yet still, she persisted, struggling to maintain the obvious façade of cheerfulness as she greeted her sister. “Yes, Tia?” the sentence was almost coughed out, as though her throat struggled to form the words without vomiting them forward, along with the contents of her stomach. “Luna… what on earth happened? Are you alright?” Celestia had fully assessed the damage to the room now, and even though she could plainly see her sister was by no means ‘alright’, she felt obliged to ask before pushing forward. Celestia’s face wrinkled with distress. The past few days she had seen… signs, but nothing of this magnitude. She was beginning to realize her sister needed her help, that something was wrong; though, what that might be she had no idea. The two had tried their best to speak and stay close after Luna’s return, but things had been… difficult. It felt to Celestia as though there were a wall between them; an invisible barrier preventing the two from truly connecting. Over the past month, however, her sister had seemed to drift even farther away, and now felt more distant than ever. It was a painful feeling, wanting to help so badly, but not knowing how. Normally the world moved at Celestia’s beck and call – now, faced with something she could neither understand nor solve, she felt utterly helpless. Celestia had begun making her way inside the study proper before Luna’s shout rang out. The black alicorn blinked, surprised at her own volume, before attempting to collect her already fragmented composure. Her artificial smile had broken. Now instead, she occupied her mouth with her lower lip, biting hard, and her teeth began to draw blood as she clamped her jaw down while speaking. Sentences chopped to pieces. Eyes like shattered mirrors. A stare that looked past the curtain cloth of the real and into the nightmare behind. Luna blinked, and relaxed her jaw, lapping up the trickle of blood from her lip as she did so. Almost immediately, her tenseness softened, and her entire posture relaxed as she sucked her lip quietly like a nursing foal, oblivious to her sister’s worried expression. The soft sound of her sucking down the fluid of her own wound echoed in the darkness. The black alicorn merely nodded quietly. She gave a small lick to her injured lower lip before speaking, her composure having leveled significantly since a moment previous. Please, thought Luna. I need you. I need your help. “Of course.” Her mouth formed a passable smile, and an unsettling stare indicated that the conversation had ended – every second Celestia spent standing awkwardly at the study door was a second Luna’s face pleaded with her to leave. Behind her eyes, Celestia thought she saw a glimmer of longing… but no sooner had she noticed it than the feeling vanished. The alabaster princess nodded before turning, exiting the room slowly. She cast one glance backwards after taking several steps down the hall, only to have her eyes meet Luna’s from the shroud of blackness inside the confined room. The noise of hoof steps faded as the marble white alicorn made her way back to her quarters. The only sound left was the quiet sniffle of Luna’s sobbing, echoing off every corner of her private prison. Please. I can’t do this anymore. It hurts. Luna hadn’t been prepared for the strength with which the pain had increased throughout the next few days. Every minute her last tattered ribbons of sanity threatened to vanish completely, leaving her trapped inside her own mind, a hellish unconsciousness of burning daylight and blurred reality that would torture her for eternity. She was relatively certain now that others had begun to notice the change in her demeanor; while she had persisted in attempting to put up a façade of normalcy, the strain was quickly becoming too much. Every corner of her vision blinked and brimmed with unseen nightmares, every sound was warped and distorted through a haze of the agonizing screams of her own mind. Every face was twisted hideously into an unthinkable monstrosity, every surface bristling with hordes of ravenous insects that sought only her flesh for sustenance. All in all, it made it difficult to smile. That was why she had to finish this. Tonight. Culmination, planning, coming together. Everything would be better. Studying in every moment of coherence brought to her by the whims of her failing sanity, Luna had researched the matter of alicorn resilience as deeply as possible. It seemed that for all intents and purposes, the few recorded instances of injury to the unicorn/pegasus hybrids were almost non-existent. Being that divinity was a hallmark of all alicorns, the concept of one being hurt to any degree of severity was almost ludicrous. Hurting someone who was, all things considered, more or less a god, was utter foolishness. You might as well take a rock and try to strike the sun from the sky. Yet, she knew there had to be a way. Some poorly documented account of violence that had achieved the unthinkable; even an old-mare’s tale passed by word of mouth would have been sufficient if it had given her a lead to pursue. After days of searching, she had been ready to give up and resolve herself to a lifetime of eternal suffering, when she had stumbled upon it. A journal. Hoof-written, or copied, bound in ancient parchment tucked between a selection of arcane reference guides in the farthest corner of the royal library. Luna suspected it had been misfiled, or perhaps never meant to be catalogued in the first place, but that was where she had found it. For the first time in months, she felt something akin to joy, before the euphoric sparks at the edge of her eyes brought about in her exuberance had revealed themselves to be the iridescent tentacles of another of her mind’s manifold horrors. She had struggled then to comprehend the nature of the new monstrosities being brought to existence by the filth of the sunlight, before running as fast as her hooves could carry her towards her study, where she had studied the text for the next four hours, barely blinking for the duration. It was a log written in old Equestrian, and even Luna, with her knowledge of forgotten dialogues and long since discarded scripts, had struggled to make sense of it. After some study, she had deduced this was partially because of the haphazard nature in which it was written. Whoever was responsible for the retelling of the accounts in the book seemed to be forever changed by what they had seen, and in no way that could be described as positive. Today, the first page began, I witnessed the death of an alicorn. Luna’s eyes had shone as she read those words, brightening with the first real smile to grace her lips in what felt like forever. This was exactly what she had been looking for. Praying for something that could finally lead her in the right direction, Luna had read on, only resting at the diary’s completion several hours later. Her eyelids had been heavy, and even in the face of her usual nightmares, sleep had seemed appealing. She knew, however, that with so little time left, the information she had gained could not be slept on. She had to put what she had learned to work, apply it to theory, and then at last to practice. So, what had she learned? Firstly, as she had suspected, alicorns seemed to be susceptible only to injuries by concentrated magic, or a force very closely associated with some kind of spell essence. The account documented in the increasingly rambling pages of the journal she had found told of the defeat and murder of a great alicorn king – no doubt he could be traced somewhere in Luna’s lineage, but was most likely so ancient that no formal records existed at the time of his death. The king had been murdered with a powerful spell concentrated from the willpower of a hundred unicorns. The details of their reasoning were muddy and hard to understand from what she had found in the journal, but were ultimately unimportant; the most pertinent matter at hoof was not why, but how. She had read in graphic detail the first-hoof account from the unnamed author as he watched the blinding surge of power that had overwhelmed the alicorn patriarch, dissolving fur and flesh before searing his bones a murky black, leaving his crumbling skeleton to collapse into dust before scattering in the wind. Disturbing under any other circumstance. Luna, however, found it inspirational. That meant there was a way. Focus. She had to focus, had to do this, or nothing would change. Every day would be the same for all eternity. Misery. Pain. Unending torture. Sadness. Isolation. She felt more alone now than she had in all those years on the moon. A cold sensation on her hooves drew Luna away from her brief visitation with contemplation; she stared at the end of her forelegs to discern the source of the discomfort. The feeling had come out of nowhere, the scratch of aged parchment being ever-present only a moment ago. Now, as she looked down, the paper had begun to bubble and melt, and the corners dripped off the end of Luna’s feet onto the cold stone floor. She stared as the words oozed and slithered into a gelatinous inky mass in the center of the page before the middle of the pool dipped, punching a hole through the rubbery paper and landing on the floor with a loud splat. The feel of the liquid parchment solidifying on her fur into a crunchy dust prompted Luna’s default reaction; she had learned several days prior in her most horrific encounter with the sun-spiders that the night-essence of her blood was curative internally, as well as externally. She felt the sting of her teeth as the skin of her already scarred lipped tore, and sucked feverishly at the wound, trying to draw the blood forth as fast as possible. Though her mouth was now a lattice-work of scars, she was relieved to have at last found a temporary remedy for the simpler of her waking hallucinations. As soon as she felt the metallic taste on her tongue her mind blanked, awash with momentary relief. Though she had also learned that constant reliance on this technique dulled its effects, the sensation of the world reassembling into its proper form always felt indescribably comforting. Her face risked a tiny smile as the puddle of words and paper gelatin floated upwards, reasserting itself into the parchment she had held moments ago. The trick seemed mostly just to work in small doses. When she had tried it that morning, awakening to frightening visions of a world engulfed by sun-fire, melting the skin from the face of every pony and leaving their screaming husks behind, the relief had not come. If anything, the fleeting glimpse of reprieve had only made the waking nightmare worse. No, she was running out of answers. Out of answers, out of time, and out of what little remained of her magic to fuel the reparations her body was beginning to require daily. Self-injury aside, the warping nature of reality had startled her into a number of accidents. Days before, she had leapt in surprise into a candelabrum and was forced to extinguish the fiery inferno that had burst from her fur. Eyes playing tricks on her the morning prior, she had been persuaded to smash a glass ornament into her face to blot out the sun that would have blinded her mind otherwise. The shards of glass in her ocular nerves had pained her unlike anything she had previously believed was possible, and the subsequent repairs had taken more energy than anything she was used to, additionally difficult due to the waves of pain that had wracked her body as each splinter was removed from her bleeding, macerated eyeballs. Seeing her vision return piece by piece with the dislodging of each razor sharp shard was an experience she hoped never to repeat. Has to be tonight, she thought. Tonight. No more waiting. Everything, to an extent, she could endure. The pain, the feeling of uncertainty at everything she saw and heard, the constant fear of the world collapsing into some horror from her wildest nightmares ; all these things, Luna theorized she could learn to tolerate. It was the feeling of isolation; of loneliness that pervaded every part of her existence, that she could no longer deal with. Every face she saw was like a picture from a storybook, lifeless and without emotion. Every pony she spoke to was like a hollow recording, void of feeling and reason, dull and unresponsive. No one could understand her. No one could feel her pain. No one could help. She was alone. Tonight, she hoped, that loneliness would be gone. Stone, melting. Covering, smothering, enveloping, suffocating. Fire in lungs. Fire in skin. The Sun. Through the walls, colliding with the earth, everything. Everything burning. Nothing left, nothing spared. Face. Her face. Sister’s face. Pure, perfect, staring at her through the inferno. Staring. Luna’s breath struggled through her lungs as she awoke. Her eyes shot immediately open, greeted by the blackness of her room, and her hooves gripped the starry-printed bed sheets underneath her. It had been too much to hope that her last day’s sleep would be peaceful. She had retired for several hours, too exhausted to stay awake before putting her plan in to motion. Even though she knew that with every slumber came the waking visions of a world scorched by the sun, the agony that spiraled from her mind into real pain and anguish, she had prayed that perhaps she could be granted one exception, in lieu of what next lay in store. It seemed the universe did not possess a well developed sense of fairness. Struggling to fill her aching chest with air as she panted heavily on her bed, Luna noticed the feel underneath her hooves; where her soft, welcoming blanket would be normally, she felt a bizarre stiffness, like a rock, or a stick of charcoal. She noticed then that she couldn’t move her hooves – they were locked in place, tethered to the mattress beneath her. Focusing her eyesight through the darkness, she looked down, fearing the worst. Ah. It seemed that in the fevered frenzy of her nightmarish inferno, she had begun to manifest pieces of the vision through her magic. She had charred the bedding and fused it with her hooves, locking the two together in a burnt husk of flesh, bone, and what had previously been comforting quilting. She was so numb to most of the pain by now she hadn’t noticed, more shocked by the rigid sensation of immobility than the feel of tender flesh seared by magical flames. Breathing out wearily and gritting her teeth, Luna’s horn shone with a swirling black aura as she focused a curative spell on the stubs of her legs, unweaving the fusion of embroidery and flesh before repairing the damage to her scorched appendages – the reassembly hurt sometimes just as much as injury, and this time was no exception. She gritted her teeth down, grinding them against each other as her hooves mended. The feeling afterwards was always one of tenderness, and a dull, pervasive ache that went on for hours. Sighing, Luna collapsed backwards from her sitting position, her head landing on her lacy pillowcase with a soft thump. A few more hours, and this would all be over. Then she could rest. In earnest, for the first time in a thousand years, she could rest. It hurt. Hurt to breathe, to think, just to be. Luna had never hurt this much before, not in all the time prior; in all her most horrific visions and bouts of agony onset by haunting ethereal creatures and sun-fire and thousands of self-inflicted injuries, the pain had felt bearable. Now, it was as though the world was collapsing under the weight of her anguish, only moments until the fabric of reality would unweave and leave her struggling in misery for all eternity. It was as though her body knew was to come, like it suspected that through protest her mind could be changed. This was why her resolve remained unwavering; even if the pain were an anomaly, returning to normal – or what she could call normal, in this case – she had to remain steadfast, to overcome this struggle and finally put herself at rest. At peace. No more pain, no more torturous solitude, no more fear. Even in the face of all the planning, Luna was afraid. The last time had been easier, requiring no preparation, just action. Jump, she had told herself, and before you know it, everything will be better. It was so simple, she hated now more than ever that things had not been so easy. Now, here she was, in the face of her final hour, and she felt nervous. Worried. And, more than anything, afraid. I have to do this, she thought, levitating the final piece of the wall into place. The room she was in was peculiar in its design – though the initial layout was that of circular castle keep, stationed at the top of a guard tower, the walls had been lined with mirrors. Shimmering reflections of herself greeted Luna at every angle. It felt strange, to see her pain reflected in so many facets; every time she caught a glimpse of her own face, which was often, she felt her expression contort even more, startled at how fatigued she looked. She felt hollow, as though her body had been drained completely, leaving only a walking husk. It’s for the best then, really. No one would want me to trouble them with my presence, looking like this. Though before she had needed no additional rationalization to give purpose to her goal, as the final minutes approached her nervousness had grown, and any means to alleviate it were good ones. Even with those platitudes, however, Luna knew she had no need of sadness or self-pity; what she was doing was necessary. Even through her own clouded thoughts, Luna knew there was no other way. Her sister had most likely known that too, when she had confronted her those thousand years ago – why she pretended to show concern or sympathy Luna couldn’t be sure. She knew her sister was perfect; as perfect as any being could strive to be. The duality of the nature they shared was, at best, a cruel joke; Celestia needed nopony’s help to be divinity manifest, a fact that had been painfully obvious from the day Luna was born. She understood, finally, after a millennium, how pathetic her life had been in retrospect. Born only to exist as a flawed imitation of such magnificent perfection, an always imperfect copy of someone so amazing. Soon, no one will pay heed to my flaws any longer. The final piece of mirror plating slid into place with a click, locking in to the fastening mechanism Luna had fitted to hold it. Everything was set just so; a circular chamber of mirrors and reflections, with Luna as its sole occupant. That meant it was time. Luna let out a long, shaking breath. She was nervous. Scared. Apprehensive. All those things, and still somehow; calm, as though she felt the purity of her purpose through a means she couldn’t quite describe. Perhaps it was the knowledge that, in a few moments, all the pain and suffering she had endured, the agony she felt with every waking moment since her banishment had begun, would at last be over. Wearily, she allowed herself a small smile, before beginning her focus. In theory, the plan should work perfectly. She had tested it previously on a smaller level with satisfactory results, and enlarging the model should prove no different. Of course, the scale of a spell at that size was one thing; something of this magnitude required a great deal more concentration. She swallowed dryly, hoping she still held enough magic within to accomplish her task. All the air grew silent as she began, the only sound to her ears being the rush of blood her heart pumped steadily through her veins. A small hum began to emanate from her horn, the first swirl of magic gathering at the base before crawling in a black glow all the way to the tip. Already, she felt herself struggling, but persisted, knowing that at this point, there would be no turning back. The burning sensation began at the bottom of her feet, crawling upwards from her hooves into her legs and onward, quickly overtaking her spine and working its way into the back of her head. Her legs twitched as they felt the throes of her body’s final resistance, and though her posture shook for a moment, her resolve did not falter; the glow of energy continued to collect around her horn, blooming brilliantly. Already, the light refracted by the dozens of mirrors around her was blinding. Luna closed her eyes as she continued, beads of sweat rolling from her forehead as she forced herself past her breaking point. Her breathing was loud and laboured, drowned out by the steady drone of her collecting magic. She didn’t think she could hold on much longer. What if she failed? What if this had all been a mistake? What if the force of her spell only left her crippled, drained of the ability to heal herself, forced to live the rest of her life in perpetual misery, unable to escape the injuries she had brought on herself? The thought spurred her forward. She would not fail. Sparks were flickering at the tip of her horn now, as though the collection of energy threatened to burn a hole in the air. Her nose inhaled the sizzling of electricity in the atmosphere, signalling that it was almost ready, almost time to let go. Just a few more moments. Luna counted down the seconds in her head as the point of release approached. Though by her estimation she had most likely long passed the point of sufficient force, certainty was the most benevolent grace in this situation. Her voice echoed in her head through the wail of collected magic as she tallied the last moments. Her entire body was shaking now, consumed by the burning fire of her pain, struggling to hold steady as her horn threatened to burst from the gathering energy. She wondered if maybe she should have said more in her final letter. What could she tell her sister that she wouldn’t already know, that she hadn’t already put into words? That she was sorry? That she wished she could have found some other solution? No. There was no need to waste space or time with banality. She knew her sister would understand. Luna shook her head and steeled her resolve, struggling to move her neck against the heavy weight of magic glowing from her horn. No, she knew this was her only recourse. No time for regret, no time for going back. This was what she must do. Time froze as she released the spell. A cascade of energy poured forth from the tip of her horn, twisting and warping at the point of its emanation before coiling into an elegant beam, bulging with the force of the magic that had been condensed into its creation. Luna’s eyes cracked open slightly against the blinding glow as the beam slowly made its way to the wall of the mirrored room. Yes, finding a way to convince a hundred ponies to help her was an impossibility; that was why her own spell compounded a thousand times would have to be sufficient. At the point of impact, the brilliant ray of energy splintered into a multitude of refractions, spitting outward in all directions to every inch of the circular chamber. Wave after wave of energy rebounded off the mirrored walls, fracturing and dividing and colliding with each other, intensifying with each impact. As she watched the spell reverberate and compound endlessly around her in slow motion, Luna’s strength gave out at last, and she collapsed to the floor, staring back at her own face. For the first time since she could remember, her expression was peaceful. Her perception began to return to its normal speed as the multiplying particles collided, concentrating into an omnipresent brightness that felt stronger than anything Luna had experienced. She could feel the air falling apart around her, dissolving in a blaze of magical fission. The heat and electricity of the glow ached in her bones. Instead of the searing agony of daylight, however, this radiance felt serene, and peaceful, washing through her body like the softest rays of the moon from a starry sky. Each cascade of magic that washed through her eased more of her pain, until she began to feel normal, for the first time in more than a thousand years. As the light overtook her, Luna turned her thoughts to the moon – her residence for a millenium, the only solace she had found since her return; peaceful, soothing, the part of the world she felt strongest inside of herself. Blinking in the face of the consuming brightness, Luna swore that she saw a field of stars waiting for her. She lifted her wings, her body feeling lighter than air, and let herself be carried forward; past the beam of light that swallowed her in its radiance, and into the calming black sky, surrounded by the thousand twinkling celestial bodies suspended millions of miles away. And there, floating amidst the fields of stars, was the silvery glow of the moon, beckoning her closer. Luna smiled for the last time as the moon welcomed her home.